The Harem Conspiracy was a plot to murder the Egyptian pharaoh Ramesses III. The principal figure behind the plot was one of the pharaoh's secondary wives, Tiye, who hoped to put her son Pentawere on the throne instead of the heir Ramesses IV. The plan was organized by the court official Pebekkamen. The plot was apparently successful in causing the death of the pharaoh, but failed in its main objective of establishing Pentawere on the throne. In the aftermath, the leading conspirators were convicted and executed. Ramesses III was born during the Twentieth Dynasty to his father Pharaoh Setnakhte and mother Queen Tiy-merenese. His father Setnakhte came to the throne by rescuing Egypt from the hands of foreign powers. After Ramesses II or Ramesses The Great outlived twelve of his sons, Egypt was put in the hands of others. Setnakhte led Egypt into the Twentieth Dynasty. It is said that Ramesses III "entered life destined for the kingship and remained at the pinnacle of society and power throughout". Ramesses III ruled Egypt for 32 years before his life was cut short. He had recently relocated to Thebes to celebrate the Heb-Sed, the rejuvenation festival that occurs after a king rules for thirty years and it continues to take place every three years thereafter. It was in Thebes where this great conspiracy was performed. In early April 1155 BC, Ramesses III was enjoying an evening in the royal harem when an attempt on his life was made. One of the king's wives, Queen Tiye, wished for her son, Pentawere, to take the throne over Ramesses IV; to effect this she had to remove Ramesses III as well as Ramesses IV. Tiye enlisted a group of officials throughout the administration as well as servants to help deliver messages beyond the harem. Tiye was also able to convince many of these officials to help act out the two-fold conspiracy. One of the pantry chiefs, Pebekkamen, was given the responsibility of becoming Tiye's ally as well as moving much of the information around. Pebekkamen received help from a butler named Mastesuria, the cattle overseer Panhayboni, and two administrators named Panouk and Pentua. Since the harem had very restricted access Panhayboni sought out the overseer of the King's treasury, Pairy, to gain access to the harem. The conspirators believed that their plot would be aided by the use of black magic to deceive the guards at the harem and to allow certain messages to be delivered. Magical spells were also used to make Ramesses III more vulnerable, making him an easy target for assassination. The plotters enlisted the court magician Prekamenef and Ramesses III's personal physician Iyroy to conjure the magic. Spells and incantations were performed while the attempt to take the life of Ramesses III was happening. There has been some dispute about how Ramesses was killed. It was once thought that poison was the most likely weapon, as the king seems to have survived the initial attack, only to die some days later. Recent study of his mummy, however, strongly suggests that Ramesses III's throat was cut, as revealed by a CAT scan. 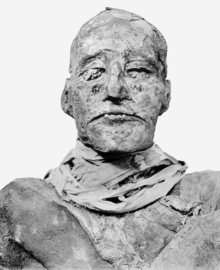 A mummy generally considered to be his son by Egyptologists was confirmed to have the same haplotype E1b1a as Ramesses III and was buried in a ritually impure goatskin, consistent with the body being that of Pentawere. After the attack on his father, the heir Ramesses IV quickly took control. The conspirators were unable to muster the support needed to oust the heir. Ramesses picked twelve magistrates to investigate and judge the case. The Judicial Papyrus of Turin, the main source of information for this event, is the court document, which states the outcome of the case for each conspirator. The document includes the punishment of seven magistrates who were blackmailed by military associates into betraying the king. They were also caught and charged. The Judicial Papyrus of Turin is the main source of evidence that the harem conspiracy occurred. Written over 3,000 years ago, it is one of the few surviving papyri relating to the event. The Papyrus is a combination of several papyri, the Papyrus Rollin, Papyrus Varzy, Papyrus Lee, Papyrus Rifaud and Papyrus Rifaud II. The text was originally separated by a thief who carefully cut the document, making sure to not do much damage to the text itself. The Judicial Papyrus was completely translated in 1937 by A. de Buck. There are multiple translations of the Judicial Papyrus of Turin, but most authors still refer to de Buck's translation. The document contains the entire list of those who participated in the conspiracy, as well as their verdict and punishment they received. The Judicial Papyrus of Turin captures the situation in Egypt at the time, as well as many cultural tendencies. The Judicial Papyrus of Turin by Ramesses III says: "As for the statements which the people made, I don't know anything about them. Proceed. And they will go and they will examine them and they will allow the one whom they would put to death to die by their own hands" (2:6–2:7). The passage describes how it is not the magistrates' or the king's responsibility that the conspirators had to be killed, it was the conspirators' fault. Further in the text it describes how some of the great criminals will have their punishments executed upon them but it also discusses how some conspirators, including Pentawere, take their own life. Overall the Judicial Papyrus of Turin contains a list of 27 men and 6 women who were charged with high treason, 5 men charged with corruption. Historians do not know what happened to Queen Tiye. Her son may have committed suicide, but nothing is known about the outcome of her trial or even if she had one. ^ Redford, Susan (2002). The Harem Conspiracy. Northern Illinois Press. pp. XXIV. ^ a b Hawass, Zahi; Ismail, Somaia; et al. (December 17, 2012). "Revisiting the harem conspiracy and death of Ramesses III: anthropological, forensic, radiological,and genetic study". BMJ. BMJ Publishing Group Ltd. 345: e8268. doi:10.1136/bmj.e8268. PMID 23247979. Retrieved 8 February 2016. ^ de Buck, A. (1937). "The Judicial Papyrus of Turin". JEA. Egyptian Exploration Society. 23 (2): 152–164. doi:10.2307/3854420. JSTOR 3854420. ^ Vernus, Pascal (2003). Affairs and Scandals in Ancient Egypt. Cornell University Press. pp. 109–120. Goedicke, Hans (1963). "Was Magic Used in the Harem Conspiracy against Ramesses III?". JEA. Egyptian Exploration Society. 49: 71–92. doi:10.2307/3855702. JSTOR 3855702.